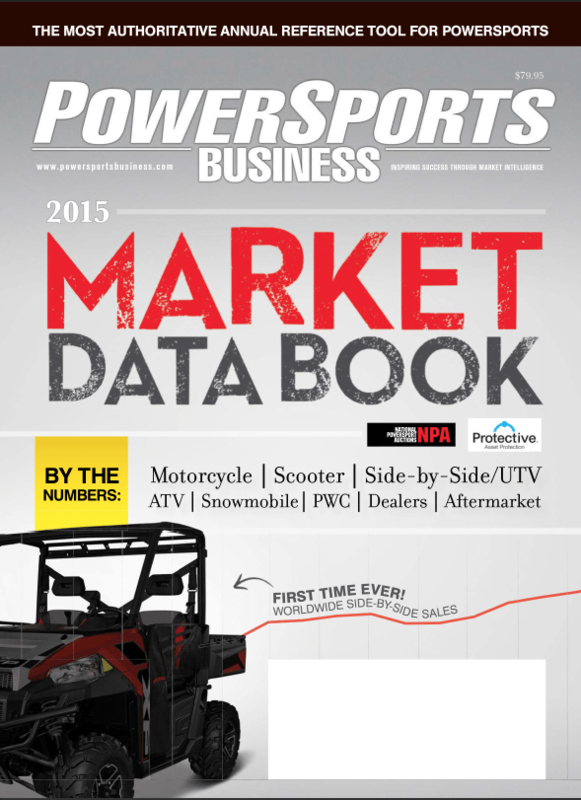 The 16th annual Powersports Business Market Data Book delivers a collection of information not found in any other industry resource. The 2018 Market Data Book includes: side-by-side global market share and sales trends; the PSB/CycleTrader Dealer Survey; wholesale price averages for ATV, side-by-side, scooter and motorcycle; U.S motorcycle and side-by-side registrations; dealer key performance indicators; dealer expense trends; average gross margin percentage on new units; wholesale seasonal pricing by segment for 2017; wholesale powersports seasonal volume; 2018 first-quarter sales by segment; 2017 vs. 2016 sales by segment; U.S. market share in various segments; dealers’ preferred OEM and aftermarket partners; UTV secret shopper study; UTV North American retail trends; top snowmobile sales states and Canadian provinces and much more. 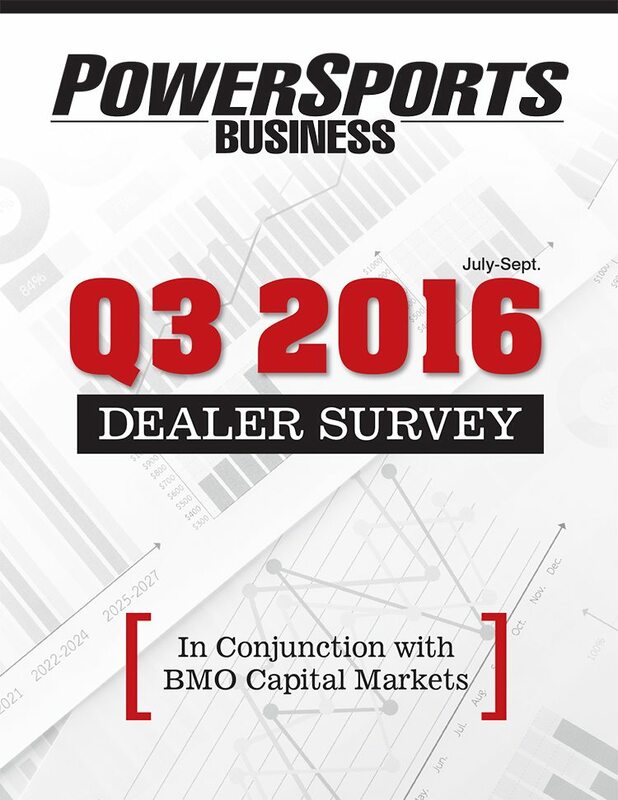 The Powersports Business quarterly survey of powersports dealerships in the U.S. and Canada is the most comprehensive survey of its kind in the industry. The Q3 2017 survey was prepared in conjunction with BMO Capital Markets. The Q3 2017 survey includes questions related to revenue; business conditions; inventory levels; new and pre-owned unit sales; P&A sales; service sales; F&I sales; customer traffic; customer buying interest; and more. 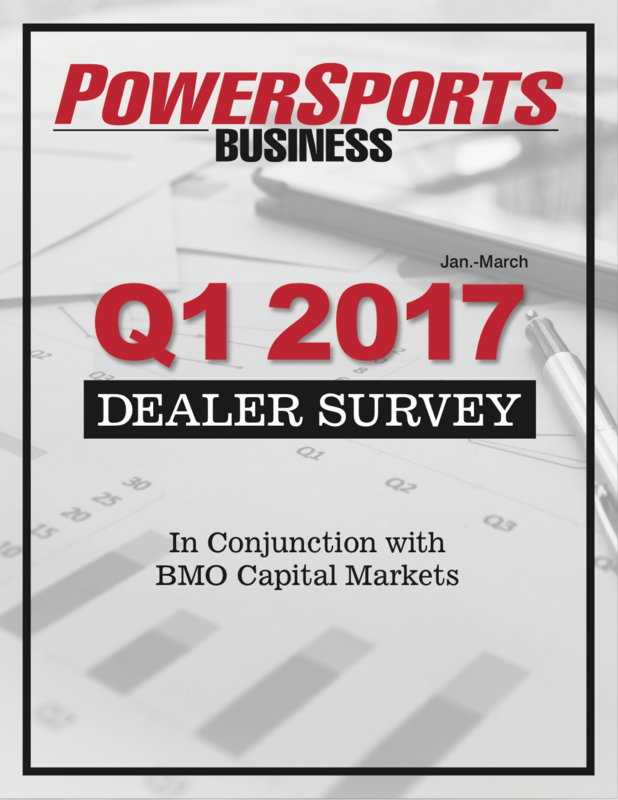 The Powersports Business quarterly survey of powersports dealerships in the U.S. and Canada is the most comprehensive survey of its kind in the industry. The Q2 2017 survey was prepared in conjunction with BMO Capital Markets. The Q2 2017 survey includes questions related to revenue; business conditions; inventory levels; new and pre-owned unit sales; P&A sales; service sales; F&I sales; customer traffic; customer buying interest; and more. The 15th annual Powersports Business Market Data Book delivers a collection of information not found in any other industry resource. The 2017 Market Data Book includes: side-by-side global market share and sales trends; the PSB/CycleTrader Dealer Survey; wholesale price averages for ATV, side-by-side, scooter and motorcycle; U.S motorcycle and side-by-side registrations; dealer key performance indicators; dealer expense trends; average gross margin percentage on new units; wholesale seasonal pricing by segment for 2016; wholesale powersports seasonal volume; 2017 first-quarter sales by segment; 2016 vs. 2015 sales by segment; U.S. market share in various segments; and much more. NEW data for 2017 includes: dealers’ preferred OEM and aftermarket partners, 2016 industry data from Statistical Surveys Inc., motorcycle and ATV seasonality charts from Wells Fargo Securities, top motorcycle sales states, top snowmobile sales states and Canadian provinces, NPA’s domestic cruiser mileage trend study and KBB.com’s top-searched OEMs per vehicle category. The Powersports Business quarterly survey of powersports dealerships in the U.S. and Canada is the most comprehensive survey of its kind in the industry. The Q3 2016 survey was prepared in conjunction with BMO Capital Markets. The Q3 2016 survey includes questions related to revenue; business conditions; inventory levels; new and pre-owned unit sales; P&A sales; service sales; F&I sales; customer traffic; customer buying interest; and more. 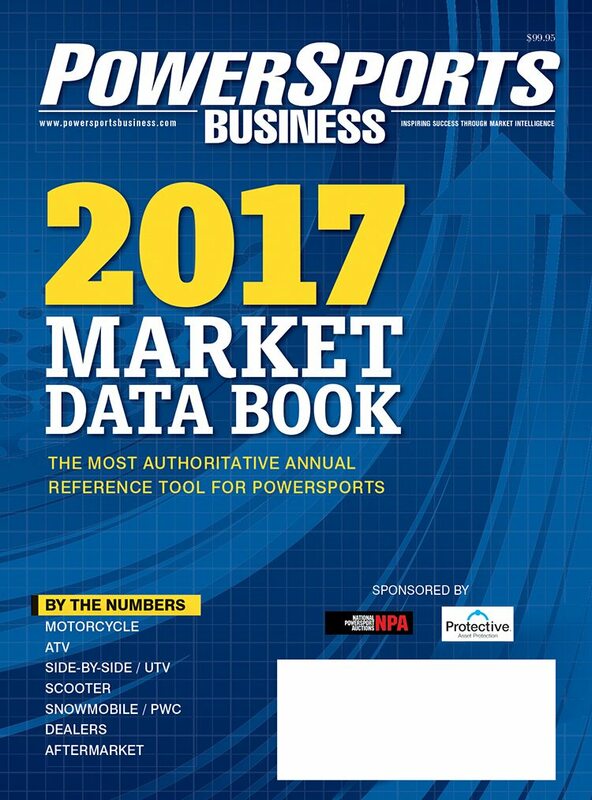 The 14th annual Powersports Business Market Data Book delivers a collection of information not found in any other industry resource. 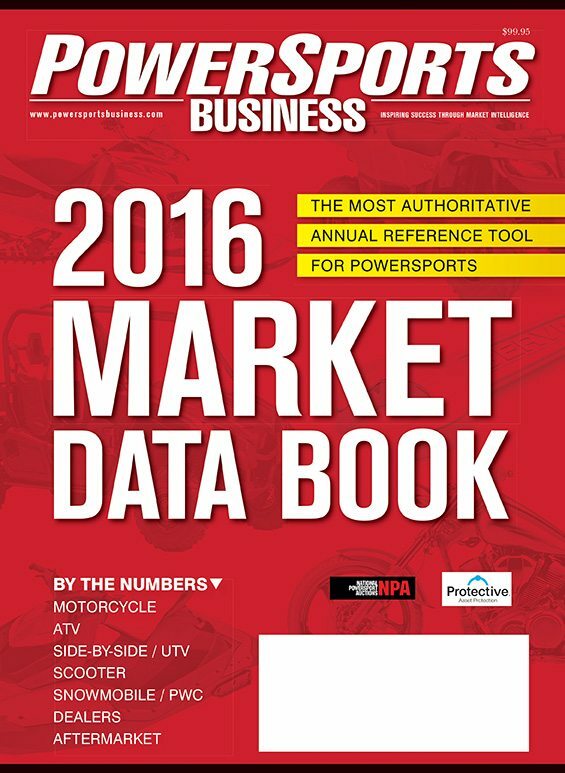 The 2016 Market Data Book includes: side-by-side market share and global sales trends; the PSB/CycleTrader Dealer Survey; wholesale price averages for ATV, side-by-side, scooter and motorcycle; U.S motorcycle and side-by-side registrations; dealer key performance indicators; dealer expense trends; average gross margin percentage on new units; wholesale seasonal pricing by segment for 2015; wholesale powersports seasonal volume; 2016 first-quarter sales by segment; 2015 vs. 2014 sales by segment; U.S. market share; and much more. NEW data for 2016 includes: side-by-side trends, accessories sold with a unit by segment and a 2016 motorcycle sales forecast. 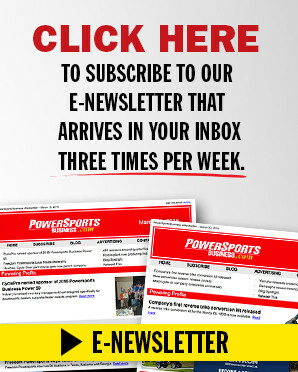 The Powersports Business quarterly survey of powersports dealerships in the U.S. and Canada is the most comprehensive survey of its kind in the industry. The Q2 2016 survey was prepared in conjunction with BMO Capital Markets. The Q2 2016 survey includes questions related to revenue; business conditions; inventory levels; new and pre-owned unit sales; P&A sales; service sales; F&I sales; customer traffic; customer buying interest; and more. The Powersports Business quarterly survey of powersports dealerships in the U.S. and Canada is the most comprehensive survey of its kind in the industry. The Q1 2016 survey was prepared in conjunction with RBC Capital Markets. The Q1 2016 survey includes questions related to revenue; business conditions; inventory levels; new and pre-owned unit sales; P&A sales; service sales; F&I sales; customer traffic; customer buying interest; and more. The Powersports Business editorial staff takes an inside look at the current and future growth of the CFMOTO USA operations. The China-based ATV and UTV manufacturer has the goal of being the No. 1 Chinese off-road manufacturer in the U.S., and we share everything you, as a prospective CFMOTO dealer, need to know about the brand. 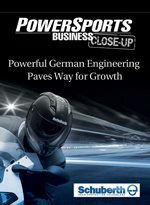 The 13th annual Powersports Business Market Data Book delivers a collection of information not found in any other industry resource. The 2015 Market Data Book includes: side-by-side market share and global sales trends; the PSB Dealer Survey; wholesale price averages for ATV, side-by-side, scooter and motorcycle; U.S motorcycle and side-by-side registrations; dealer key performance indicators; dealer expense trends; average gross margin percentage on new units; wholesale seasonal pricing by segment for 2014; wholesale powersports seasonal volume; 2015 first-half sales by segment; 2014 vs. 2013 sales by segment; U.S. market share; and much more. Dealer survey; Dealership revenue breakdown by size of dealership; Dealership workforce by size of dealership; Dealership employee benefits by size of dealership; Dealership breakdown of full-time and part-time employees; Most popular wholesale vehicles and their values;Average gross margin percentage on new units; Average parts counter ticket study by region; Average repair order study by region; Average parts counter ticket vs. lines per invoice; Average revenue per RO; Memorial Day study of metric and V-Twin parts counter sales; Average days open per dealership; Top 5 most researched online PG&A products and categories; Wholesale season sales price averages by month and vehicle segment; Wholesale seasonal volume; 2013 first-half sales; Powersports industry sales percentage by total segment; U.S. market share by segment — motorcycle, ATV (UTV not included), snowmobile, PWC; UTV worldwide market share; ATV worldwide sales; ATV worldwide market share; ATV unit sales by quarter; Annual U.S. ATV unit sales; U.S. motorcycle unit sales by quarter; Annual U.S. motorcycle unit sales; Snowmobile worldwide unit sales; Snowmobile worldwide market share; PWC sales by region; PWC worldwide market share; Annual U.S. scooter unit sales; U.S. scooter sales by quarter; Plus international data from Canada and Japan. Learn from fellow dealership owners, service technicians themselves, aftermarket companies and others about the importance of making the correct hire in the service department. This 25-page white paper is the latest publication from Powersports Business editors that provides dealers with yet another way to improve their bottom line. In it you'll find a variety of ways to ensure success in your service department hiring process, from individual dealership case studies to a presentation of the questions that you should be asking during service tech interviews. We also look at techs and how they go to where they are today. With the service department's revenue stream growing more each year, the white paper's goal is to provide guidance for growth. It's brought to you by the Motorcycle Mechanics Institute. An inside look at Schuberth, the innovative German helmet manufacturer.